From early traction to today’s growth, see how Belly cracked the code of a multi-sided, network effects driven model to find success in the small business marketplace. You may not have heard of Belly, but what they’ve achieved by building a multi-sided marketplace business in the notoriously difficult small business market is nothing short of impressive. Through an intense focus on establishing localized network effects, a repeatable go-to-market strategy, a no-lose proposition for small business owners, and a highly valuable and enjoyable user experience, Belly has created a sustainable growth engine that has propelled the company from 17,000 users to more than one million in just 15 months. In just two short years, the Chicago-based startup Belly Card (commonly known as Belly) has helped thousands of small and medium sized businesses overcome customer retention problems through their novel and easy-to-use customer loyalty platform. Their solution is now used by over 5,000 merchants across 46 states, helping them reach well over a million customers. Belly is a customer loyalty program that offers merchants the ability to provide customized rewards to their customers, while delivering powerful business intelligence back to the store owner. Its iPhone app, gamified user experience, and social media integrations provide an enjoyable experience that drives repeat use by consumers and fuels word of mouth adoption. The Belly solution bridges the gap between a customer’s in-store visits and allows merchants to build and maintain a lasting connection once they leave. If you were to ask Belly’s CEO Logan Lahive how they've grown, he’d tell you that Belly relies “on the most traditional form of advertising there is: a one-to-one interaction between a customer and a cashier," but a closer look reveals that Belly’s growth is driven by an affordable solution, aggressive local sales and direct marketing efforts, localized network effects, strategic business development, and a gamified/phone based consumer experience. Small businesses have long understood the benefits of customer retention, particularly as they’ve faced increasing pressure from big box stores and online outlets. Due to cost, time and technical constraints, the most sophisticated loyalty programs have been little more than email newsletters or buy 10 get one free cards. These approaches have failed to keep up with the loyalty and CRM programs implemented by their bigger competitors. At the same time, small business technology has been focused more and more on customer acquisition, through the transactional, one-off sale. Companies like Groupon, Living Social and the hundreds of clones have tried to convince businesses that the answers to their problems are in driving more foot traffic through eye-popping discounts. These massive discounts tied to big email databases certainly drive lots of new customers, but little to no profit and almost no long term value to the business. Belly went against the trend of flash sales to create a more sustainable business model for their small business customer. They developed an affordable subscription-based product that helped these merchants cultivate longer, more meaningful, and more profitable relationships with existing customers—turning them into loyal shoppers who produce a sustainable and more valuable customer base. 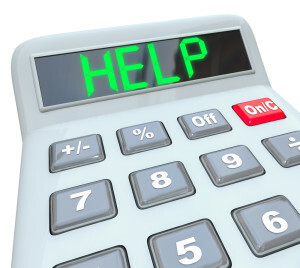 With customer insights and an easy to use system, small business owners who couldn’t afford the hassle or time to set up a complex customer management system could deploy a loyalty system quickly, and have access to the customer behavior data that gave them some of the same tools and insights that were previously only available to their big box competitors. Small businesses aren’t Belly’s only market. Larger chains that operate on a franchise model are consistently looking for ways to drive store revenues and customer retention. Large franchise model stores are using Belly to enable their store owners to build up customer loyalty, increasing revenue per customer and critical same store sales metrics. Belly’s all-in-one merchant system and smartphone-based consumer redemption platform make it easy to roll out within franchise systems. Franchisees, often loathe to take on one more thing from corporate are pleasantly surprised by it’s ease of use. The corporate office then gets to roll up data from across Belly installations to learn more about how local customer behavior, which can be used to inform marketing and product decisions, as well as drive local in-market advertising and promotion strategy. 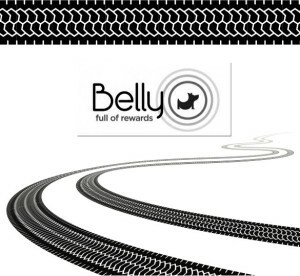 Customers of small businesses that use Belly are rewarded for their loyalty. They earn perks and rewards that are relevant to them and delivered via the Belly app on their phone. Belly’s integration with iOS in particular means that rewards and offers are delivered and retrieved easily—customer’s no longer need to worry about leaving their punch card on the dresser at home. These customers get rewarded for shopping locally, which makes them feel good about patronizing local sellers. In addition, they receive an improving customer experience, as Belly helps the store identify and tailor benefits to them. All on top of a fun, gamified experience of earning points and gaining rewards. Belly’s early traction was driven primarily through three main elements: obsessive focus on customer development, direct sales localized to their market area, localized network effects, and continual iteration on product to drive adoption and viral sharing through a gamified experience. Prior to building and releasing the first iteration of Belly, the team spoke to hundreds of merchants in the Chicago area to understand merchant needs and challenges. This is the ultimate in customer development: leveraging customer interviews and research to help define the problem and pre-sell the solution, all while identifying what the likely must have solution is for their target audience. Through their research, the Belly team found that merchants wanted a way to verify a customer was in the store and a way to establish a deeper, lasting connection with each customer. Of course it had to be affordable and easy, and it had to produce measurable returns that could justify the expense. Many of the other small business solutions, notably foursquare, didn’t provide the in-store validation, and lacked the back office management and other customer loyalty elements that were important to SMBs. Belly knew that they were selling a complex solution (customer relationship management and retention solution) to a customer base (SMBs) that is notorious for being difficult to sell to, slow to adopt new technologies, and has an exceptionally limited wallet for new investments. The outcome of their customer development was a very SMB friendly program that eliminated these and many other barriers to adoption that plague other technology startups in the channel. Belly built its solution so that they are able to provide new merchants joining the program with everything they need to run the solution: the software, the iPads to run the software in-store, point of purchase (POP) marketing materials and physical Belly cards. They also offered a free 30-day trial and low monthly subscription price point of less than $100 to get merchants started. By providing the hardware and app in-store, Belly turned every merchant into a new point of customer acquisition, driving growth of both sides of their market with every new sign up. The Belly team gained traction initially the old fashioned way: pounding the pavement and phone lines to reach and sell SMBs in the Chicago area. They were able to sign up 500 merchants in Chicago alone through this approach, reaching local critical mass and enabling network effects to take hold among the local business customers in the city. Once early traction was established in Chicago, the business began to benefit from localized network effects—as more customers saw Belly in more places, more customers and merchants began to talk about it and request it, driving adoption in the area and making it a fixture on Chicago countertops. This boots-on-the-ground approach let them penetrate an SMB market often skeptical to the “latest, greatest idea” and clearly articulate the value proposition of the platform, while distancing themselves from other SMB-focused technology plays, particularly Groupon and other flash sale sites. The local sales outreach, combined the low friction adoption process paved the way for establishing a local beachhead in Chicago. Many SMB technology plays underestimate the importance of local sales forces to successfully sell into the channel. YellowPage companies have long maintained massive sales forces to establish and maintain SMB relationships. The biggest argument against the approach is of course the cost of the salesforce. But by taking a market-by-market approach, Belly leveraged their customer development and this insight to find success where many others have failed. After establishing a strong hold in Chicago, Belly looked to its next market, Austin. In what can be inferred as a savvy South By Southwest launch, the Belly team seeded the Austin market in February (SXSW is in March), signing up merchants ahead of the popular tech conference. This move likely gave Belly early awareness from techsetters in town for the conference, gaining the company not only a second market, but also attention of tech press and more advocates for Belly in many different metros around the country after attendees returned home. While many companies talk of making a splash at SXSW with a big consumer launch, Belly seems to have followed the model of another local-focused company, foursquare, in their SXSW strategy. In 2009 foursquare launched the app by focusing on badges and activities in Austin, making the app highly useful and relevant to event attendees. Belly, by pre-seeding the market with lots of new merchants offering rewards, made the app relevant to early adopters as well, driving repeat use and new word of mouth adoption in the process. In addition to the smart local sales roll out and development of a repeatable market launch strategy, the Belly app creates word of mouth awareness through Facebook integration, gamified points and rewards, and simple sharing of activity to customers’ social feeds. This creates interest among users’ friends both on-site (What are you doing and how are you earning points?) and drives incremental downloads and adoption. Because Belly hits four important psychological rewards (discovery of something new, achievement through points, status through loyalty, and monetary benefits) the app creates a powerful driver of sharing and adoption. It’s easy to understand that seeing a status update on Facebook of a friend getting a reward at an unknown place in your backyard creates tempting link bait to click through and learn what he or she knows about that you don’t. While it’s hard to measure the effectiveness of this approach on the outside, it at a minimum adds tail wind to all other marketing efforts, and at its best can be a powerful acquisition driver. The gamified experience, rewards, and word of mouth growth help fuel bottom up demand for Belly at local merchants. This bottom up approach provides several benefits to Belly. First, it helps Belly determine which markets to focus on next. By seeing the total number of users with the app and inbound requests from merchants to get set up on the platform, the company can use the data to determine where to focus their resources for success. Second, consumers asking about Belly at local merchants drive inbound leads as small business owners’ interest is piqued by their customers asking about it at checkout. Third, it supports their national and franchise sales efforts (more below) by driving demand for the platform up through the national chains from franchisees in the market. Despite only being two year’s old, Belly has evolved substantially to sustain accelerated growth. In December of 2011, Belly reported 275 merchants using the platform and over 17,000 users who checked in over 45,000 times. Just 15 months later, Belly now has more than 5,000 locations across 46 states, one million users who’ve checked in more than nine million times. For every tech startup that has crashed on the rocks of the SMB market, Belly has cracked the code to launch new in-store technology. Its secret? Deep understanding of its customers’ needs. This has not changed from early days, when it used customer development to create a product and service that addressed nearly every SMB concern up front—including giving away the hardware. Belly offers all-in-one plans and pricing that starts at $79/month including the hardware needed to get started. In addition to easy set up, the Belly software provides an out-of-the-box email and mobile marketing platform that is driven by rewards that make sense to the unique needs of the merchant. The in-depth reporting does a great job of demonstrating ROI—the check-in nature of the product provides true end-to-end visibility. There is no guessing about its value. Belly is extending the initial loyalty platform focused on retention to address customer acquisition needs for SMBs as well with new products such as “Belly Bites” in numerous key markets. “Belly Bites” is a customer acquisition platform masked as a free sampling platform that targets new customers based on existing consumer data acquired on demographics, shopping patterns, and historical interactions. The “Bites” platform allows partners to tailor offers of free giveaways through which Belly can target the would-be consumers through its web and mobile applications, as well as email. As with other parts of its business, Belly is focused on customer acquisition that works for SMBs. Instead of the untargeted nature of flash sales, the customer acquisition program through Belly is targeted and meaningful to the merchant. The existing customer base is critical to Belly’s sustained growth. It acts as a strong tailwind for all marketing initiatives, including user acquisition, expansion into new markets, and SMB adoption. Belly leverages word of mouth (as discussed earlier) through their deep Facebook integration and ease in sharing check-ins and rewards claimed, and the gamified rewards experience keeps user engagement and retention high. Keeping customers engaged and using the platform is core to creating value for the SMB customers on the platform, and Belly has continued to make the app more engaging and easier for customers to find participating Belly merchants and claim rewards. As part of their strategy Belly integrated with Apple’s Passbook with the release of iOS 6 in late 2012. This integration puts Belly in front of more iPhone users and makes it easier to keep Belly users engaged. With Passbook, there’s no need to remember to open the app every time you want to check-in or claim a reward. Belly’s not ignoring Android either. Recently, the company integrated with Google’s mobile payment product, Google Wallet. Belly knew that while going door to door, city by city was a necessary way to gain early traction (see Paul Graham’s “Do Things That Don’t Scale”) it wouldn’t give them the hockey stick growth they would need to win the SMB loyalty market. 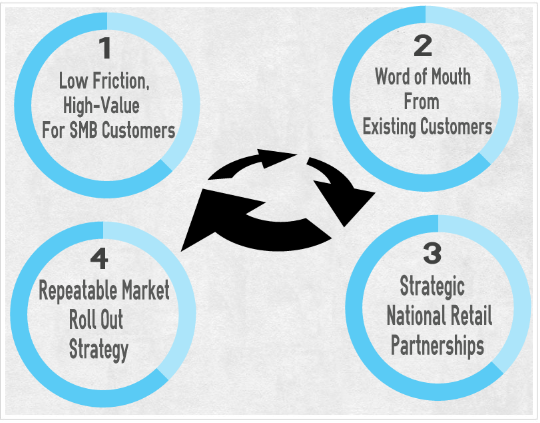 So in addition to the bottom up approach it used launching cities, Belly leveraged user and SMB adoption in cities to fuel strategic partnerships with national retail chains. By working both bottom up and top down Belly could use local activities to drive interest in strategic partnerships. Belly CEO Lahive attributes the company’s entry into this space to numerous inquiries from franchisees in markets where Belly had already gained substantial traction. For example, franchisees of national chains were approached by Belly sales reps in Chicago. Stores like Subway, 7-Eleven and others are typically individually owned and operated. Some of these operators likely mentioned it to their market managers (liaisons between franchisees and the corporate office), creating upstream awareness of the new product within these organizations. Belly leverages this local data about potential national partners and uses organizational awareness to pre-warm partnership targets to their top-down pitch. Combining this awareness with their data about their user base in the potential partner markets creates a compelling reason for these chains to partner with Belly. This is a much more effective approach than simply pitching all national chains with an abstract idea for customer retention. The power of pre-warming demand from franchisees, organizational awareness, and local data that shows the potential opportunity creates a compelling business case for these massive entities to engage with the startup. Belly has executed effectively on this strategy signing up more than 100 national accounts with over 600 locations each including companies like 7/11, Chick-Fil-A, and Dairy Queen. These big wins drive chunks of growth and provide faster market penetration to new market areas. As Belly hones its formula of low friction adoption, localized word-of-mouth network effects, and strategic partnerships, it can now repeat this formula in its aggressive roll out to new markets. Belly’s early strategy to launch in Chicago is turned into their in-house playbook for how to expand into more markets and grow them quickly. This playbook focuses on creating tipping points for adoption in each city, allowing Belly to successfully “launch” a market and create powerful in-city momentum. Based on their playbook, internal resources and data about where to launch next, Belly can launch multiple markets quickly and effectively—driving the momentum across the country and exponentially growing the business. Now, with a proven model, their goal is to launch as quickly as possible in as many markets to keep copycat companies out. Belly is an interesting case study because they have found success in a market that is coveted by tech startups but is rarely cracked: the massive small business market in the US. In addition to this feat they have also successfully built up a multi-sided marketplace—another hurdle that is rarely cleared by new companies. Now with a proven model, their challenge is to expand into more markets and lock out local copycat plays. They continue to build the business, and recently took a strategic $12.1 million investment from 7-Eleven’s venture arm to drive further growth and expansion. This cash is more than just VC cash, it’s an endorsement of the model by a key player in their target market, much like the partnership of Visa and Square. We hope that by analyzing how they did it, and sparking conversation about how to successfully approach and penetrate the SMB market with a two-sided market solution, more entrepreneurs targeting small business opportunities can find takeaways that lead to a greater hit rate of new companies finding success. Much of this information is inferred or taken from bits and pieces of public information and from studying the business. In other words, it’s our best assessment, but is by no means complete. We hope that the information open to interpretation will create dialog among us which will help us delve deeper into the true reason behind Belly’s growth. The best outcome of this analysis is that entrepreneurs looking to crack the code of small business market penetration, building a multi-sided marketplace, or leveraging network effects to grow their business will find insights to help drive the growth of their business. Whether it be paid search, local sales, business development or otherwise, Belly has shown from the beginning that they are able to execute on the fundamentals of marketing. It’s no question that these channels are core drivers in their expansion. Our exclusion of a deep dive on these tactics does by no means diminish their importance, rather we feel that the elements highlighted above create the unique fingerprint for their growth engine that has fueled success. 1st Tweet: "Hey Sean- Great post. Impressed by research & depth. Happy to chat to fill in details." 2nd Tweet: "You did some solid work. I was quite impressed. Walked around the office to see if anyone interviewed..."
3rd Tweet: "You got lot right. Missed some things that wouldn't be public. As w/ all tactics, devil is in details." Great write up and very interesting business. I just downloaded the app and have been exploring - it made me want to try some new places in my area. So I guess part of the sell to SMBs is that, as well as driving loyalty among existing customers, the app also promotes their business to new customers in their area via the "Nearby" feature. Easy to see why that's a pretty compelling sell to an SMB with a tiny or zero marketing budget. Sam—great point, they are able to not only drive incremental revenue from loyalty programs, but also offer a compelling discovery engine that harnesses local intent and drives new in-store visits. Thanks for reading! I read the ebook while it was still being offered for free and let me tell you, it is TOTALLY worth the money. It's worth x10 that in my opinion. Thanks Sean for putting it together. I am growth hacking for a startup called Jolt (joltup.com) and it is amazing to have a resource like this considering we are catering to the same market. Secret to Belly's success: 1) In (seemingly) every single store in my area (Lincoln Park, Chicago). I have 3-5 chances to scan my card / day. 2.) Real secret - scanning the card was very easy, takes 1 second to scan, and works every time. It sort of makes the in-store checkout process a little hectic since you're paying, then scanning your card, while trying not to hold up the person behind you. So if the card didn't scan in 1 second and work every time, I definitely would have stopped using it. Just one small thing that made a huge difference in continued usage. Thanks for sharing. Not many people actually know what "Belly" is. Are there any major growth efforts that you've seen from Belly that we missed? Do you agree with our interpretation of the data? @logan What ever happened to Belly Bites? Just got this on Twitter from ‏@dwightchurchill "@SeanEllis favorite belly hack: sign viewable from boats on Chicago river." Hard to know how much of a factor it is, but great to get one more piece of data. Thanks Dwight! haha... literally just a handwritten block letters we wrote on 8x11s and taped in the office window. We're on Chicago River, and have daily tour boats sailing past. Likely acquired between 7-10 new users for us (no tracking was included in this campaign) - but what the hell... growth hacking, right? I think you are referring to Andreessen Horowitz. Likely worth mentioning the name when criticizing a startup for raising more capital from a guy like Jeff Jordan. If that's wrong, I don't want to be right. Lots of things to hate about all startups, and can't please em all... but on this one, you sir, are inaccurate. Correct me if I'm wrong, but it looks like their series A was $2.5MM in early 2012 from Lightbank and Silicon Valley Bank. Perhaps they went through 2 rounds of series B funding.